A new social networking app called Vero has hit the App stores. The app claims to provide true social networking experience by focusing on user-generated content. Unlike Facebook, Instagram, and Twitter, Vero doesn’t display advertisements. Ads are one of the major sources of revenue for the world’s most popular websites. Vero won’t display ads to its users. How Will Vero survive? Recently, the company had announced that the first 1000k users of the Vero app will get free access to its all features. This indicates that the company might introduce subscription plans in the future. Vero has a dark-themed interface. It is easy to use. Here’s my review of the latest social networking application. Vero is a very large app. It consumes 91MB storage memory. Vero doesn’t let users sign in with their Google, Microsoft account. During the account registration process, the app asks users to enter their full name, email address, phone number, and password. Once users enter the requested details, the app will send a four-digit verification code to their mobile device. Users must verify their identity/account by entering this number. Once your account is ready, the app will display an option to upload a profile picture, enter a bio, add connections and follow people. You can skip these options or complete your profile to access the Vero app’s main interface. Search: Vero provides a search utility with which you can find people, posts, photos, videos, links, videos, music, books, places, etc. The app lets you find posts by hashtags. When you enter the hashtag name and tap the search button, Vero displays a list of posts. 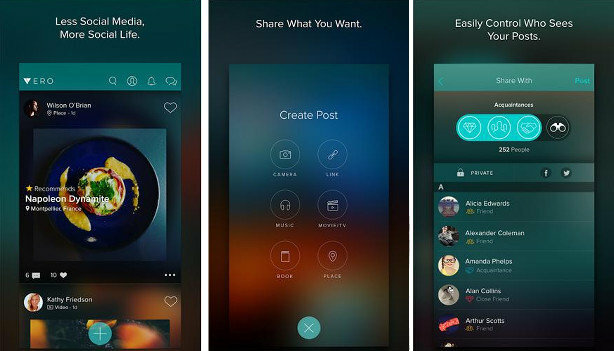 Sharing: The app allows you to share photos, videos, music, and places with other users. You can share pictures and videos of any resolution in this application. To create or share new posts, tap the plus sign button. Collections: A user may share different stuff with their followers and friends. The collections tool of Vero categorizes the posts so that the user doesn’t have to waste time in finding specific posts. Notifications: Apart from displaying push notifications on phone, Vero has a built-in notification panel where you’ll find the list of friend requests, messages, etc. Avatars: The Vero app supports three profile pictures. You can configure the app to show a different profile picture to friends, acquaintances and close friends. Messaging: As in Facebook, you can send text messages to friends in Vero. You can add smileys to the chat messages but you cannot add pictures or videos to the conversations. Comment/Like: Vero lets users like posts. It also enables users to comment on posts shared by other users. You can add emojis to the comments in the Vero application. Block users: If you get too many requests from a profile, you can block the profile in the Vero application. Once the user is blocked, he/she won’t be able to send messages or friend requests to you. Report content: If you find a post inappropriate, you can report it to the developers by selecting this option. Hide Posts: Vero provides an option to hide posts from the feed. If you don’t want Vero to ban/disable the account of the user that’s sharing objectionable things on Vero, use this option. To unhide the posts, open the settings interface of the app. Scroll down and select “Hidden Posts” option. Delete: You can delete profiles manually on Vero. To delete your account, navigate to the settings panel and select the delete option. Conclusion: Vero has many features. It also has options to manage privacy. It has a feed section where you’ll find posts shared by friends and people you follow. The app doesn’t have advertisements. If you’re looking for an alternative to Snapchat, Facebook or Instagram, try Vero. Vero is one of the few social media application that doesn't use advertisements as a source of revenue. It has plenty of features and an easy to use interface.